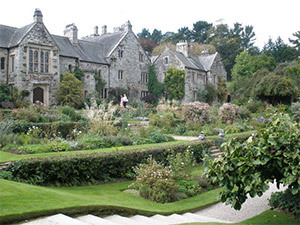 Cotehele (Cornish: Koesheyl) is a mediaeval/Tudor house located in the parish of Calstock, built sometime around 1300. The house is located on the banks of the Tamar River, and belonged to the Edgcumbe family. The house and grounds are reputedly haunted. There have been sightings of "misty figures" as well as a robed apparition at the front door. An "attractive... herbal scent" has been smelled only to mysteriously dissipate. A “treacherous warder” was killed near a bridge on the approach to the house, and it is said that there is a bloodstain here that cannot be removed. For further information, please read Haunted Britain by Antony D. Hippisley Coxe and Ghosts: Mysterious Tales from the National Trust by Sian Evans. Calstock (Cornish: Kalstok) is a civil parish and a large village in southeast Cornwall, England, on the border with Devon. The village is situated on the River Tamar 6 miles south west of Tavistock and 10 miles north of Plymouth. Pictured left is Calstock village from the viaduct courtesy of Ben Harries. Licensed under CC BY-SA 3.0 via Wikimedia Commons.